62 Steps from first to third floor. 4 Large clocks near the top of the tower (one on each face). 440 Tons of exterior sandstone and brick. 7 Interactive computer kiosks in the visitors center. 53 Miles of electrical wire. As warmer weather brings blossoms and green growth, this spring also breathes life into the interior of the Gordon B. Hinckley Alumni and Visitors Center. 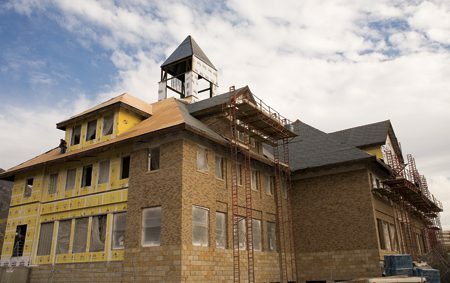 The building’s interior has begun to take form and preparations for building displays—including a visitors center to introduce guests to BYU—are well under way. The pool of donors also continues to grow, now surpassing 66,000. Donors who contribute before May 1 will have their names included in a book given to the prophet. Watch the construction progress online at gbhb.byu.edu. INFO: To donate, call 1-800-525-8074 or visit byu.edu/gbhb.